Is listening to music going to make your child smarter? Not exactly, but researchers suggest it will create new pathways and connections inside her brain. Every day, with the help of new technology, researchers are gaining more insight into what promotes early development. During the first years, your baby’s brain rapidly builds complex networks of structure and function that are necessary for mature thought processes to take place. These connections multiply through the stimulating experiences your little one has. Whether they’re good or bad, these experiences will have a decisive impact on the architecture of her brain and extent of future skills. In a process called neural pruning your daughter’s brain begins an adjustment and will eliminate all the unnecessary associations to concentrate on maintaining the strong ones. This is why your little one’s environment and experiences are crucial for her future learning development. Music greatly contributes to the formation of patterns of brain connections, specifically on the right hemisphere’s activities such as creativity, artistic expression, and musical intelligence. These connections have been proved essential to the development of life-long thinking skills, cognitive development, communication, and expression processes. Studies have discovered that music knowledge and activity in the brain are not localized in one specific region, but that it involves the memory, auditory, visual, emotional and motor systems. Findings have shown how music has an effect on the memory retrieval in babies as little as 3 months old. 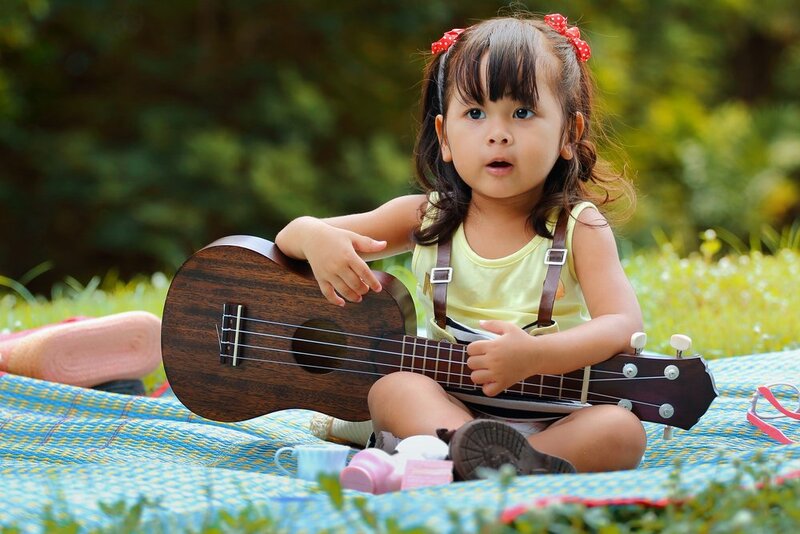 Other studies have also shown how songs and stories provide pathways for advancing language skills, increasing memory and exposing children to the structure, rhythms, rhymes, and melodic patterns of language. Music has also been shown to assist in learning, retrieving, and reconstructing a text. Findings on a study demonstrate how a text was better recalled when it was heard as a song, rather than as speech. Music provides repetition of patterns and rhythmic information that makes it easier to learn. How can you make music a part of your little one’s daily life? Switch screen time for music. Instead of turning on to the TV as a source for entertainment, play songs or different instruments. Make it even more fun by incorporating dancing and singing. Associate specific songs to specific tasks or day times. For example, in the morning you can say hello to the sun with the song “Oh Mr. Sun”. During play time you can build towers while listening to “London Bridge”. When it’s time to put the toys away you can sing the “Clean up song”. You can incorporate songs to almost every task you do during the day, even washing your hands and brushing your teeth. Try to incorporate funny gestures, faces, or even other toys to keep your little one engaged. Give her a chance to make her own music as well. By banging two toys together your little one is exposed to rhythm, movements, and sound patterns. Harris, M. (2009) Music and the Young mind: Enhancing Brain Development and Engaging learning. The National Association of Music Education. Kinedu is an app which allows you to harness the learning potential of your child's early years with a personalised plan for directed play and real-life interactions.